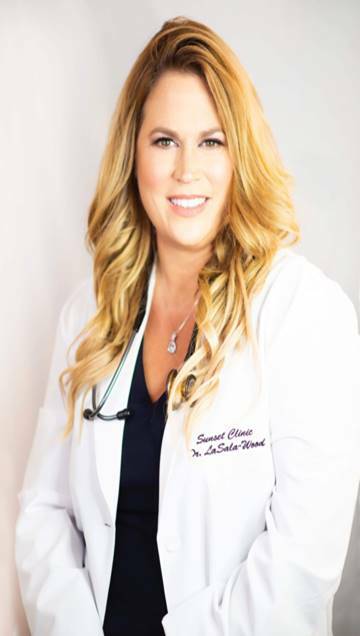 Susan LaSala-Wood (FNP-C, RNFA) is the Owner and a Primary Care Provider (PCP) of Sunset Clinic, while also serving on the Board of Directors for the Arizona State Physicians Association (ASPA). AANP board-certified and a long-time resident of Scottsdale, her impressive background includes Urgent Care, Pain Management, Orthopedic Trauma/Surgery, Cardiac Surgical Trauma Intensive Care Unit (ICU), Neurological ICU, Emergency Room, Post-Anesthesia Recovery Unit, and Operating Room. Her experience includes caring for patients in 19 Phoenix area hospitals. Second only to her love of taking great care of families, she also enjoys teaching others during their journey into the healthcare profession. Susan taught 30 courses to 1000+ students at the prestigious Mercy College of Health Sciences and currently serves as preceptor for students at Arizona State University (ASU), Georgetown University, and Grand Canyon University (GCU). Outside of the office, Susan enjoys spending time with her husband and their 4 adult children. She is working on her private pilot's license, and enjoys flying with her husband in their private airplane around this beautiful part of the country. Recently, Susan was featured on the premiere episode of the Health Star Worldwide Communiations Network. Host Mark Lewis spoke with Susan and Dr. Aprajita Nakra about how the Arizona State Physicians Association serves independent medical providers and their patients. Click here to watch the show and see/hear Susan's passion for her patients and how independent healthcare providers are uniquely positioned to provide the highest quality care.